Once upon a time, in a land far, far away, when elementary teachers weren’t on work to rule (or whatever it’s called), school kids in Ontario would all be rejoice at the annual fall field trip to a local apple orchard where they would be treated to a wagon ride, hot apple cider and picking a few apples right off the tree. Magic. Last PD day, my son was kindly invited to a visit to one of our local orchards with some friends (yes I was working again, boo hiss) and he came home with some Golden Delicious and Spy apples. 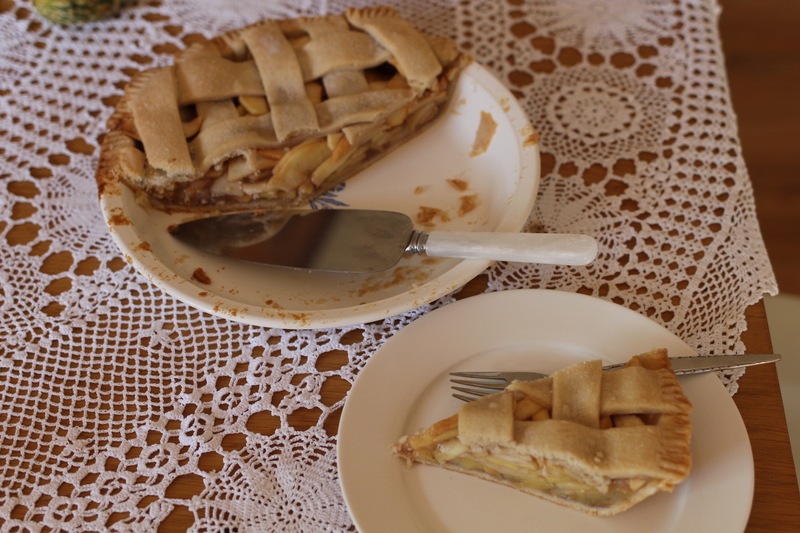 According to the Ontario Apple Growers, these are just right for baking, so we had to make pie! It’s great to try different varieties and these are not typically available in grocery stores so it was lovely to have a change. It’s also a great idea to learn about the different varieties and how they are best used so that you get the most enjoyment from them as you can. Some apples are great to eat fresh and will hold their shape while baking, but not every apple is great for cooking and baking. To avoid mush, pick ones like Cortland, Golden Delicious, Crispin, Idared, Russet, Spartan and Spy for pie. Mac’s are ok but I prefer them for applesauce as I think they do mush up a little more than I prefer and I have to admit they are my least favourite apple – for taste. Now I need to tell you something…the brown you may see on some apples is not a flaw. This is a natural process called russeting. Many traditional varieties have a lot of russeting but consumers today don’t like to buy them because they think the apple has gone bad. Don’t be put off if you see this matte, brown marking on otherwise firm apples – they are just fine! Now back to the baking! I used a blend of the two varieties because I love it when you get different flavours and textures in your mouth. The crust is my go-to Canadian Living recipe – full credit to them as I haven’t adapted this at all over the years because it’s perfect as it is. However, I did make a lattice top for the first time and the kids were amazed at how fancy it was! I was amazed at how easy it was! Just make sure you put a tray under the pie in the oven to catch the juicy overflow that will burn and make your smoke alarm go off. There isn’t a whole lot more to say about this pie, except…even though I am trying to be good, I had a slice for my lunch today instead of something healthy and sensible. Enjoy! Make the pastry ahead of time; at least one hour but up to four days before. In food processor, put chunks of shortening into food processor, add butter, flour and water. Blend continuously until it mixes, then forms a ball. It will take a little longer than you think. If it feels like 4-5 minutes, stop and sprinkle in another tbsp or so of flour. Then carry on. You want the dough to be quite sticky as you’ll add more flour for rolling and you don’t want it powdery. Remove from food processor, place on top of large piece of plastic food wrap and form into ball with your hands. Wrap well with food wrap and refrigerate for up to four days or at least an hour before rolling out. 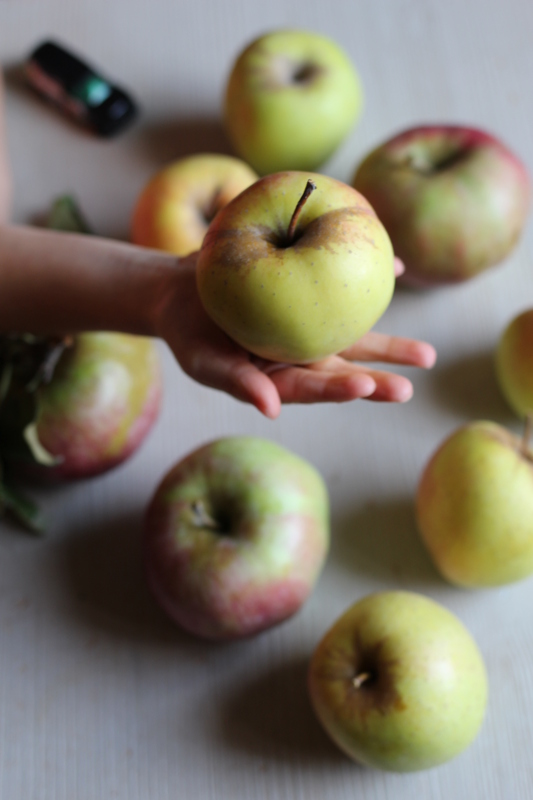 Before you want to roll your dough and bake your pie, prepare your apples. Wash, peel, core and finely slice them. Place in large bowl and squeeze lemon over, stir to coat. Then stir in cinnamon, sugar, and flour. Set aside. Wipe and dry your counter, then dust with 1 tbsp flour. Cut dough in half and put half to the side. Place one half in the middle of your floured surface and press to flatten with your hands. Then flip over and do the same again, adding a sprinkle more flour (if you need) to avoid sticking. Work quickly to keep the dough cold. Using a rolling pin, start from the middle of the ball and roll outwards, moving up and down, then side to side to form a large circle. The circle doesn’t need to be perfectly round as long as it’s large enough to cover the base of your pie dish. About half way, lift it carefully, sprinkle a little more flour and flip it over. Then carry on rolling until it is about .5 cm thick consistently. Fold the disk in half and carefully lift it over the pie dish, then open it up and gently push it to fit the dish. Fill with apples so they lay quite flat. 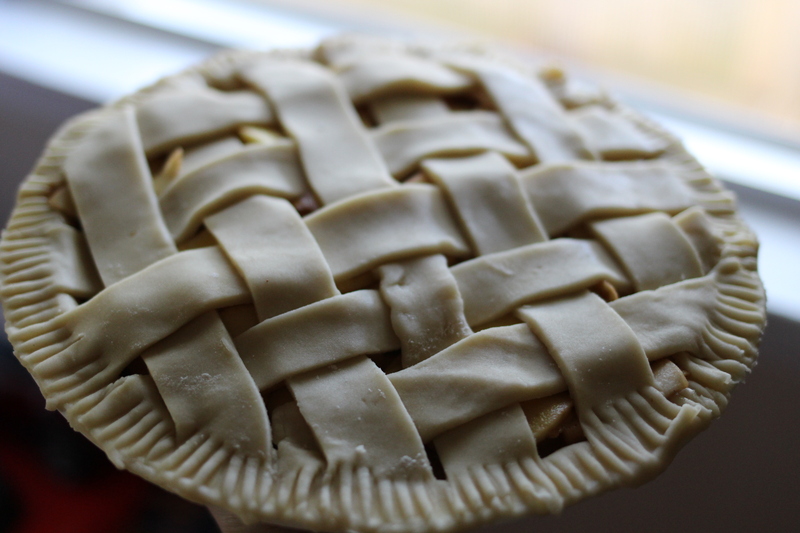 With a sharp knife, cut extra dough away from the edge of the pie plate. Set the extra dough aside. Prepare the second ball of dough in the same way, rolling out. 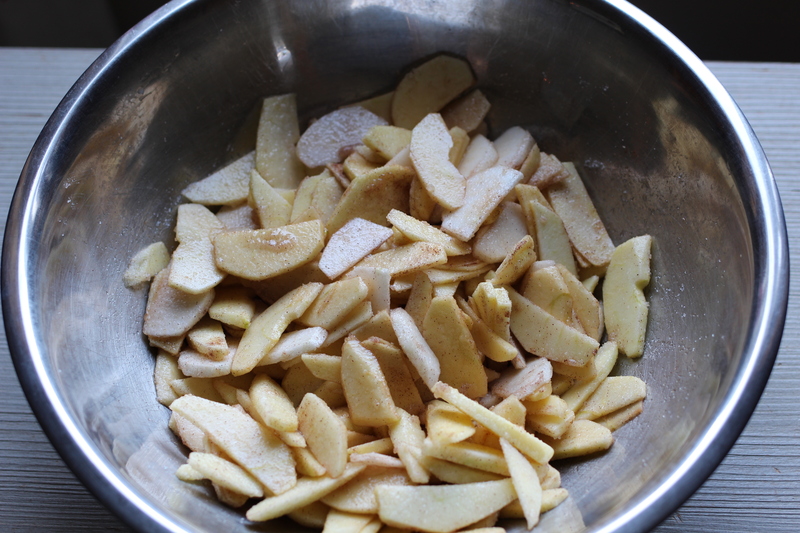 Lay it on top of your apples and press the edges together with a fork tines. Cut an X in the middle to allow steam to escape. If you prefer a lattice top, cut the dough reserved for the top into strips about 1.5-2 cm wide. Lay down rows in one direction. Then carefully weave in strips in the other direction, ensuring they go under and over the opposing rows. Press around the edges with the fork tines to finish it off. Bake in middle rack on 350 degrees for about 40 minutes. Start watching after 30 minutes to ensure it doesn’t get too brown around the edges. If this is happening, cover the pie edges with thin pieces of aluminum foil. Let cool before serving or the hot filling will “gush” out. If it’s almost cool, it should stay firm when cut. Tip: If you want to get a browned finish, brush the top of your pie with one mixed up egg yolk and sprinkle with white sugar. I didn’t bother doing this. Serve with a dollop of whipped cream if you like. 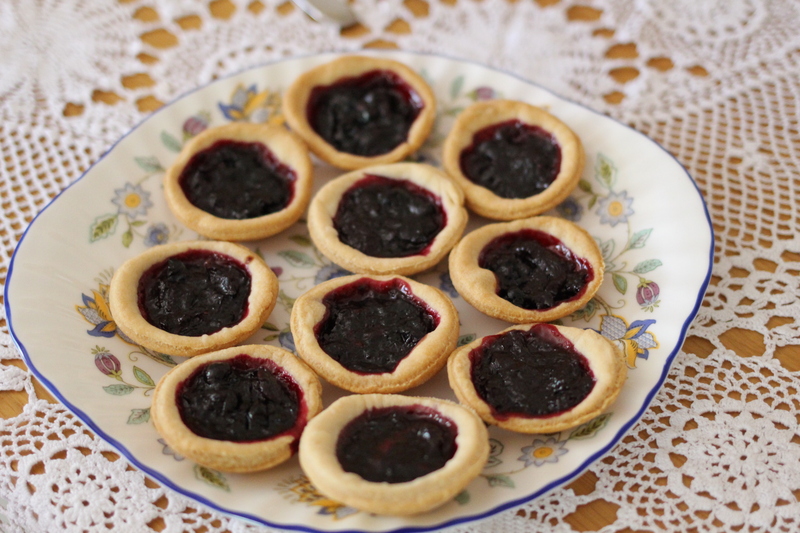 I had extra pastry, so I re-rolled the leftovers and created some mini jam tarts by cutting out small circles with a glass top, placing in a tart baking tray and filling half way with home-made cherry and blackcurrant jam. Any jam will do but don’t use the store bought “low sugar” stuff to make jam tarts as they won’t set. Also, don’t overfill the tarts or they will stick to the pan and break when you want to get them out of the tray. Bake for approx. 20 minutes in the same oven as the pie. Remove once the edges are slightly brown. Next Post Fast Macaroni and Cheese. Not from a box. Beautiful baking and beautiful photography! Many thanks! I really appreciate it!